British Pie Week has been running since 2007. British Pie Week takes place the first full week in March (starting on a Monday) and lasts for 7 days. 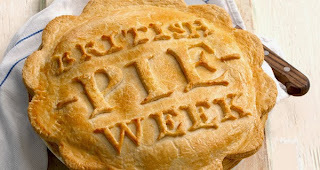 Here at www.pierate.co.uk we whole-heartedly support British Pie Week. It is a great reason to celebrate a classic British tradition. We can't argue with the principle: a whole week eating British pies and a whole week promoting British pies. Whilst it started as a marketing campaign by Jus-Rol, the British market leaders in ready made pastry, it is now so much more! You can buy a pie, go to a fine pie restaurant or be inspired to make your own pie. It really is your British Pie Week. British Pie Week really took off in 2011. Or at least it seems to us that it took off in 2011 as that is when Pierate first started celebrating it! Since then British Pie Week has inspired us to do a few things we don't normally do, from baking pies to a whole day eating only pies, see below for a summary of our antics! And remember, British pies are for life, not just for a week of the year called British Pie Week! 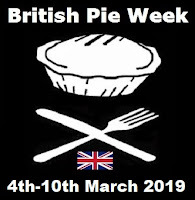 British Pie Week 2019 is rapidly approaching and you can find out all about it on the World's leading pie review blog! 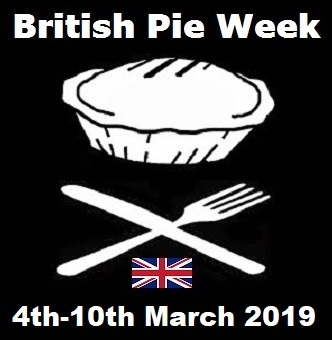 We once again have a Countdown to British Pie Week article and you can find out more about the launch of the British Pie Week 2019 logo too. Two things we are particularly looking forward to this pie week are our Birmingham Pie Night at Pieminister (on Monday 4th March) and attending the British Pie Awards (on Wednesday 6th March). It's the 11th time they are hosting the pie awards and you can find out more in our Countdown to the British Pie Awards article! Plus we have a special trip planned over the weekend of British Pie Week - stay tuned to the blog and Twitter to find out where to!! It was another jam packed British Pie Week for us aboard the Pierate Ship in 2018, with the first Birmingham Pie Night to be held in the Pieminister Pie Shop, along with a busy Wednesday helping judge and do media at the British Pie Awards in Melton Mowbray. This was the 10th Annual Awards ceremony and was won by Turner's Pies, whose Steak and Ale pie was Supreme Champion! We pie rated them in November and they were unsurprisingly Pierate Highly Recommended! The week was also marked by us having our first ever pie review to have over 20,000 views, as we rated some more of the Radford's Family Pies! 2017 was the second time that the British Pie Awards took place in early March, to coincide with British Pie Week! It was odd to have to write it, but fortunately the British Pie Awards 2017 ended with a pie classed as the winner (following controversy at the British Pie Awards 2016) - and the pie in question was none other than home favourite Dickinson and Morris Melton Mowbray Pork Pie. In addition this year we had a special com-pie-tition with the winners getting a judging spot at the British Pie Awards! You can find out who won here but needless to say we were delighted to meet our first competition winners on Wednesday 8th! 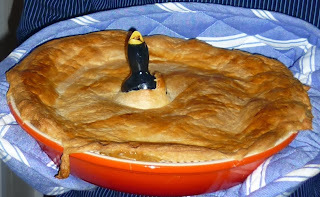 This year we also introduced a "Everything You Need To Know About British Pie Week" article, which had over 4,500 views before British Pie Week had even started and on Monday night we had our first British Pie Week Pie Night - following other similar events in Novembers in the past! British Pie Week in 2016 was between Monday 7th and Sunday 13th March and featured us eating pies in England, Scotland and Wales - including "pie in the sky" as Pierateer Rob flew back from England to Scotland while munching on a Kandy Bar Bakery Scotch pie! 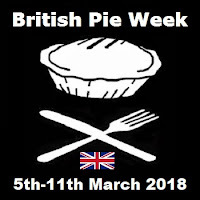 British Pie Week in 2015 was from Monday 2nd March to Sunday 8th March and between two Pierateers (RAS and SJL) we managed to smash the previous best of 55 pies consumed by eating 71 pies between us! And if you'd be willing to give to charity Action Against Hunger, in support of our crazy pie commitments, you can do so on our justgiving page. Find out what the Pierateers commited to do during British Pie Week by reading the Pierateers Pie Pledge article and following the #PiePledge hashtag on Twitter! In British Pie Week 2014 all the Pierateers and even the Ship's Cook made a #PiePledge commitment to brighten up the week! Click here to see them all! The pledges attempted to take pie eating to extremes beyond those already seen in 2013. A staggering 55 pies were consumed. Pierateer SJL ate pie for every meal as his pledge which meant 21 consecutive pie meals consumed! If this didn't seem extreme enough Pierateer RAS went a whole day eating only Sweet Apple Pies and Pierateer TJP spent a whole day eating only Pork Pies (Somehow neither of them were sick!). The Ship's Cook made a brand new pie reci-pie as her #PiePledge and Pierateer ARL searched Gran Canaria for a slice of pie abroad. 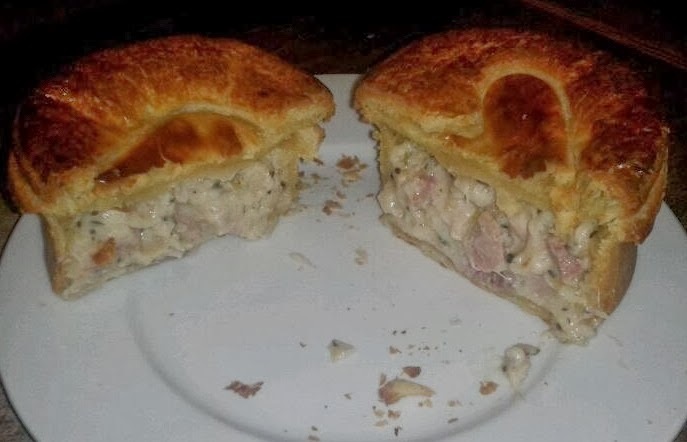 As he hadn't suffered enough with his pork pie gorge, Pierateer TJP also made a Python pie which turned out to be just as disgusting as you might have expected! 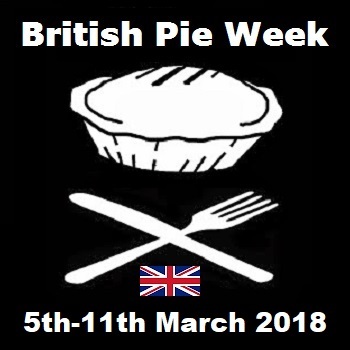 Many of our #PiePledge ideas were unveiled live on air on BCfm Radio when Pierateer RAS was in the studio on Wednesday 26th February – just days before British Pie Week! British Pie Week 2013 saw the creation of the first Pierate pie-ary (or pie diary) for British Pie Week in which we recorded our pie intake. Pierateers SJL, RAS and TJP consumed a humongous 50 pies between them in the week. This included the #onlypiesallowed challenge undertaken by SJL on Day Two in which SJL consumed only savoury pies for the whole day. In total SJL ate 11 pies and 3362 kcal during the challenge. The epic pie consumption in the week helped the Pierateers tick over 150 pies reviewed. A total of 5 pies were consumed as the Pierateers make a good start. RAS and TJP both get into 'double figures' with two pies consumed. Mr Kipling and Pub pies got them through the day. As previously mention SJL went the whole of Day Two consuming only savoury pies. No food was eaten that wasn't encased in pie pastry, which meant not even veg or mash with the pies! RAS was pleased Aston Uni celebrated British Pie Week with a pie and mash night. TJP even filmed a video for his Pork Farms Pie review. Pierateer RAS led the way on Day Three with 5 pies consumed. RAS was on leave from work, partly to help with the All England Badminton Championships and partly to encourage pie consumption and reviewing. Two types of Morrisons pies were consumed Apple and Apple & Blackcurrant. However the Apple & Blackcurrant were in shocking condition with their lids fallen off! It was also good to see an Apple pie served at the badminton. SJL had a fallow day with only one ASDA pie eaten. TJP went to his old favourite, Pieminister, for an elusive Pietanic fish pie. SJL went into the kitchen to try a pie experiment. He made the world's first ever 'Piezza'; a pie with a pizza on top. Whist the flavours weren't quite right, this unusual combination made for a change mid way through British Pie Week. RAS put in another solid performance with three pies consumed. Two more Morissons pies and also a Sainsbury's Crusty Bake Pork Pie. TJP yet again delved into his emergency stack of Mr Kipling pies. Despite dental treatment, meaning he couldn't eat for a few hours, RAS still ate a further 3 pies. Two more Morrisons Apple & Blackcurrant pies from earlier in the week plus a Lamb, Potato & Veg pie from Urban Pie. He was also pleased to see an article about his pie review in the All England Badminton volunteers' newsletter. TJP ticked off another Pieminister pie with a trip to their Farringdon branch to try the Deerstalker Pie. SJL again relied on ASDA with a Steak & Kidney plus two pork pies. Sadly, the pie count from TJP dropped significantly because he didn't realise British Pie Week included the weekend! What a disappointment. Nevertheless SJL and RAS soldiered on. SJL enjoyed a pork pie (from a local farm) sold in an Ipswich co-op. A box of co-op Apple pies boosted his pie count. RAS took British Pie Week international by sharing a Tesco pie with his Italian housemate. Let us not forget the highlight of the day when RAS had the opportunity to address 200 other Badminton volunteers after donating some Pierate merchandise as a prize. A Pukka pie was consumed to round the day off. RAS consumed some more of the Morrisons pies plus a pie from a local butchers shop to celebrate the fact that it was also National Butchers Week. SJL had Co-op and Waitrose pies before a homemade Chicken & Chorizo pie was baked for dinner. The Pierateers were perhaps quieter in British Pie Week 2012 than might have been expected. This was in part because two of their number were abroad. However Pierateer RAS flew the flag for British Pies with 3 reviews. To introduce the week he grabbed a Sainsbury's Chicken & White Wine pie which went down very well. Day Two saw him in old favourite Urban Pie for a Lamb & Rosemary pie which went down equally well. To close the week RAS ate a 19 Gales Farmhouse Foods Steak Pie although he was gutted that it was just a top-crust! Pierateer ARL also remained British with a homemade, slow cooked Pork Pie. SJL and TJP both saw first hand British influence around the world, finding pies in Hong Kong & Australia respectively. SJL enjoyed his Ostrich Pie but not the Chicken Pie because the pastry was sweet (not what he expected!). TJP proved that the Australians really are fanatical about pie, revealing that the Pieface chain are everywhere in Sydney. 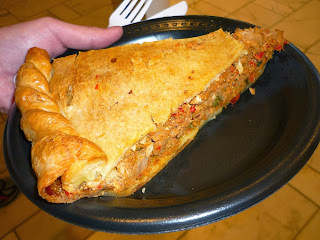 He also enjoyed a slab of spicy tuna pie from Rhumba in Melbourne. Pierate celebrated its first British Pie Week in 2011 (although of course the Pierateers had previously eaten British Pie Week pie). The introduction questioned why there were not more pie reviews on Pierate in British Pie Week. This was quite simply because the Pierateers were too busy eating pies! There was only one pie reviewed during British Pie Week but SJL proved that pies were being eated with two homemade pies. Firstly a vegetarian Lentil pie recipe was reviewed, similar in taste to a Shepherd's pie but with pastry instead of mash. However, SJL proved that the Pierateers are pie eaters, not pie makers, with disastrous pastry. Secondly SJL made a Vegetable pie while at the same time reviewing a Raven's den Chicken & Ham pie. SJL left us with these words taken from the British Pie Week website. "A pie is not just a combination of tasty food and the best pastry, it is one of civilisation’s most cracking inventions created through a combination of genius and passion."